Bevel-up planes are another approach. While still basically a jigged blade that cuts wood, they have important differences from bevel-down planes. The geometry of the edge, how it is supported, and how it interacts with the wood matter greatly in cutting tools. As an example, think of a piece of paper. It is a powerless cutting tool when approaching your finger square on – it collapses. Yet, when effectively stiffened by an extremely skewed approach, it can draw blood annoyingly well. Geometry matters. Bevel-up planes allow the use of thicker blades that are supported closer to the cutting edge than in bevel-down planes. Both factors dampen flutter and, along with alterations in the attack angle, obviate the need for a chipbreaker to pre-tension the blade edge. The Veritas Bevel-Up Smoother (above) has a 3/16″ thick blade that is supported up to about 3/32″ from the cutting edge. 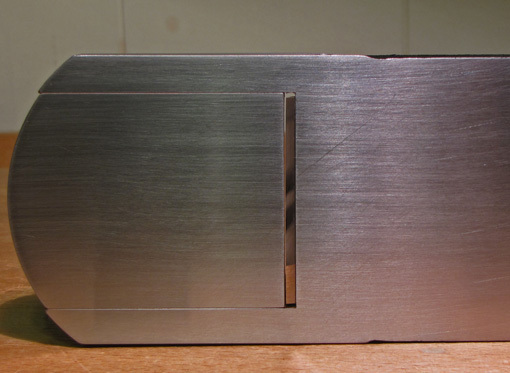 This gives bevel-up planes some wonderful practical advantages. Blades changes are easy; there’s no fussing with a chipbreaker. On Veritas planes, the Norris-style adjuster conveniently controls depth and blade angle with one knob. Mouth adjustments are much faster than closing the throat by adjusting the frog on a BD plane. The gap below is about 0.010″. The strategy here is simple: change the attack angle by simply swapping blades. With a 12° bed, a blade honed at 33° gives an attack angle of 45°. 38° and 48° honings give attack angles of 50° and 60°, respectively. Again, it is the angle of just that last bit of blade length near the edge, well within the width of a secondary bevel, which matters to the wood. So, here we are back at a 60° angle to greatly reduce tearout, but it is not the same geometry as the 60° achieved with a 10° back bevel on a 50° frog in a bevel-down plane! The BU plane is driving a 48° wedge into the wood, while the BD plane is driving a 30-35° wedge. Add differences in blade mass, edge support, and edge tension, and these are two different animals, theoretically and in practical feel at the workbench. Sharpening is also different. I find it is more difficult to get a keen edge honing a blade at 48° than at 30-35°. Remember too that the lower bed angle must be taken into account when estimating the amount of camber required. Please see here for the reason. I continue to advocate that bevel-up smoothing planes are better with the blade bedded at about 20°. This would require a blade honed at 30° to make an attack angle of 50°, and honing at 40° to attack at 60°. Those are easier to sharpen and are narrower wedges to drive through the wood. None of this should be construed as saying I do not like BU smoothers, or that BD or BU is categorically better. Both can perform beautifully but they must be understood to get the most out of them. Ultimately, the wood will speak. In the top photo, my BU smoother is hustling through figured bubinga. The photo directly above shows the wavy grain and what a jointer machine did to it. Tearout is virtually eliminated with the BU smoother but getting a 48° wedge through this hard stuff is tough. I like it better on less dense curly woods and rowy woods such as the quartered face of some mahoganies. It has also worked unexpectedly well on curly pear. You must experiment and pay attention to the wood. 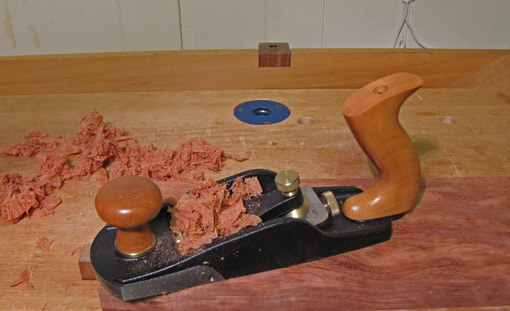 For choosing which to buy, I think either BD or BU can generally get the job done if you knowledgeably configure the various elements of the plane to suit the work at hand. It is not necessary to own both types of smoothing planes, but I admit that I like having a variety of options. And yea, I also kind of like messing around with them too. Thanks for sharing your knowledge, I have learned quite a bit reading this series. The BU advantages you mentioned are the main reasons I purchased the Veritas Jack plane, I have been increasing the camber with every sharpening too. Anyway great read and looking forward to the next! Thanks, Tim. I’m glad the information is helpful.